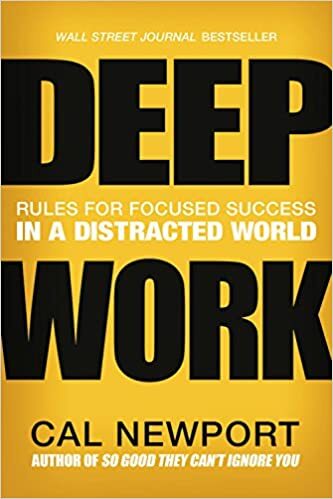 Although its subject is not the law, Cal Newport’s book Deep Work, Rules for Focused Success in a Distracted World is worth the read for legal professionals. Professional activities performed in a state of distraction-free concentration that push your cognitive capabilities to their limit. These efforts create new value, improve your skill, and are hard to replicate. Noncognitively demanding, logistical-style tasks, often performed while distracted. These efforts tend to not create much new value in the world and are easy to replicate. Newport theorizes that ‘knowledge workers’ (like attorneys) are losing their ability to perform Deep Work due to network tools (email, social media, web surfing and the like). Constantly sending and receiving emails erodes the ability to perform Deep Work. A 2012 study found that knowledge workers spend 30% of their time on email. Newport views that as a bad thing. But I’m not sure it is for attorneys, which I’ll get into below. Newport offers advice for draining the ‘shallows.’ He advocates limiting internet time and not allowing yourself to be distracted when performing Deep Work. In other words, don’t take calls, check email or take a web surfing break. Also, don’t constantly check for new emails or messages. He thinks it’s important to not use your phone for distraction/entertainment when doing things like waiting in line or killing time somewhere. He advocates dumping social media completely because it is designed to be addictive and doesn’t have much utility. Much in this book rings true. Deep Work is required for many aspects of litigation. But I don’t think Newport recognizes the utility of email. He’s 35. He did not work in the pre-email world. Email is a godsend for attorneys. Before email, lawyers traded phone calls for days and spent an inordinate amount of time on mail. As far as occupying time, email saves significant time for attorneys compared to communicating in the pre-email era. If email eats 30% of attorneys’ time, I’d guess it replaces letters and phone tag that used to eat 50% of attorneys’ time. On the downside, I believe email increases stress and anxiety for attorneys. Before email, most work news arrived once per day with the morning mail delivery. Now, news appears in the inbox all day, everyday. I don’t know why this makes the day more stressful, I just know it’s true. I concede that email is distracting. It’s easy for me to not use social media. Staying off the web is harder. I can do it if I want to. But not constantly checking email is very hard. It’s just too tempting with electronic filing notices coming in all day and attorneys using email as their main form of communication. Different practices require different amounts of Deep Work. Some practices require very little–some a lot. Different attorneys approach it differently. Some are more adept and switching between cases in a day. Some attorneys are known for basically focusing on just one case for an entire work day. Everyone needs to figure out what works best for them. It’s worthwhile for attorneys to think about how Deep Work fits into their practice and how they can perform it better. And by ‘better’ I mean both more efficiently and higher quality.